This is College Physics Answers with Shaun Dychko. When multiplying or dividing, your answer will have as many significant figures as the value with the least significant figures in your calculation. So, this has four significant figures, three significant figures, five significant figures and this number has three significant figures. And so, the least number of significant figures among these four different quantities is three. And so, our answer will have three significant figures. In part B, saying 18.7 squared means multiplying 18.7 by 18.7 and each of these has three significant figures and so our answer will also have three. 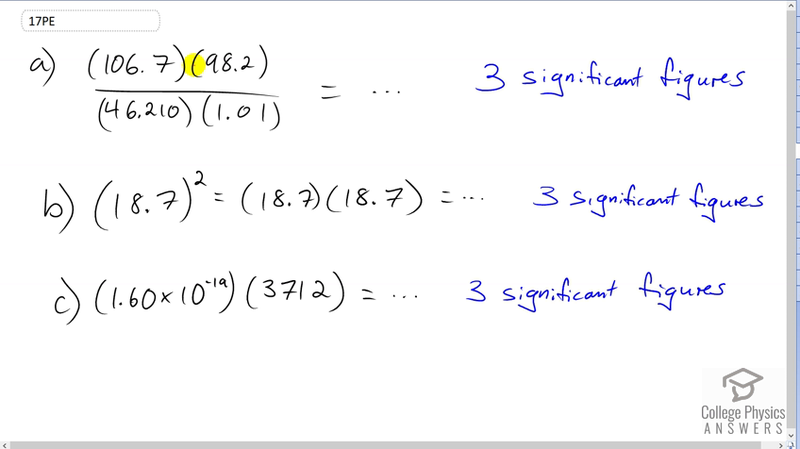 And then in part C, we have four significant figures in this quantity, but this one has only three significant figures 1.60, and so, our answer will have three significant figures since it has to match the number of significant figures in the least... the number with the least significant figures in our calculation.